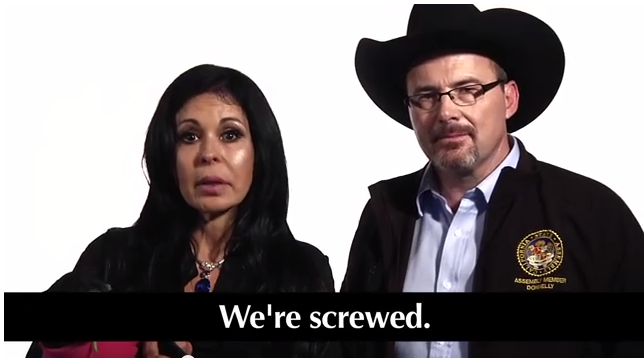 I don’t really know what’s worse: If watching a video of Tim Donnelly pledging to put a goddam gun in every goddam American home, or witnessing the pathetic, supposedly funny translation by María Conchita Alonso while clutching a pet named Tequila and informing us about the large size of Donnelly’s balls. I am also not sure how I managed to make it to the following 3 minutes below, but I did. Sadly. In any case, I felt I had to say sorry to my Californian friends. This blogger will be praying for you. This entry was posted in Immigration, Latin celebrities, Politics, Racism, Stupid propositions, Television and tagged California, Maria Conchita Alonso, Republicans, Tim Donnelly. Bookmark the permalink.